These prayers below, known as Acts of Faith before Communion, reinforce a fundamental belief of our Catholic faith, namely, that as we read in the first of these, that our Lord is truly present to us in the Sacrament of the Eucharist in body, blood, soul, and divinity! I most firmly believe, O Jesus, that in this Holy Sacrament You are present; that here are Your Body and Blood, Your soul and Your divinity. I believe that You, my Savior, true God and true Man, are really here, with all Your treasures; that here You communicate Yourself to us, make us partakers of the fruit of Your Passion, and give us a pledge of eternal life. I believe there cannot be a greater happiness than to receive You worthily, nor a greater misery than to receive You unworthily. All this I most steadfastly believe, because it is what You have taught us by Your Church. Many Catholics, along with others of our Christian brethren, believe that Christ is present only symbolically in the Eucharist. 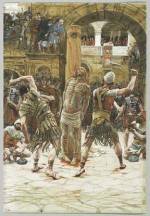 Yet this goes against Church teachings going back to the Gospels themselves. The first sentence of this second of these Acts of Faith Before Communion quotes our Lord’s emphatic response to those who doubted His words on this subject (John 6:56). Lord Jesus Christ, You have said, “My Flesh is food indeed, and my Blood is drink indeed.” I firmly believe that You are present in this Blessed Sacrament as true God and true Man, with Your Body and Blood, Soul and Divinity. 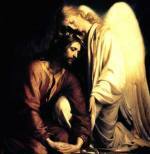 My Redeemer and my Judge, together with the angels and saints I adore Your Divine Majesty. I believe, O Lord; O Lord, increase my faith. The third and last of our prayers here also reinforces our faith in what we call Christ’s Real Presence. It quotes our Lord’s words from the Gospels that we also hear during the consecration of bread and wine at Mass, namely that “this is my body… this is my blood” (Matt 26:26-28; Mark 14:22-24; Luke 22:19-20). Of a truth I firmly believe, O Good Jesus, and with lively faith confess, that You Yourself, equal to God the Father in glory and in power, true God and Man, are verily and indeed present in this Sacrament. For You, the very Truth itself, have said This is My Body, This is My Blood. I believe whatever the Son of God has said. Nothing can be truer than this word of Him who is the Truth. I do believe, Lord; help my unbelief, increase my faith. In the Mass, Jesus offers Himself up to His heavenly Father for us for the forgiveness of sins as He did at Calvary, only in an “unbloody” manner. When the words of consecration are spoken by the priest at Mass a quiet miracle, our mystery of faith, takes place, on altars all over the world every day. Christ really and truly becomes present to us, under the appearances of bread and wine. 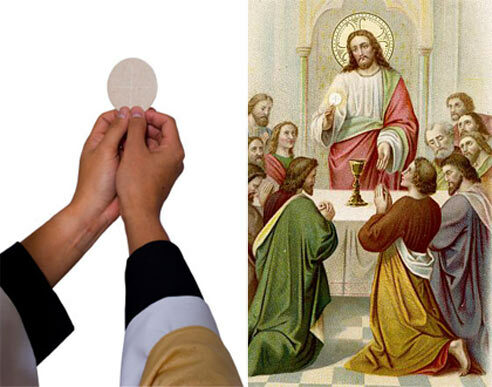 (Our Lord is shown in the appearance of bread, in the form of the host, in the picture on the left above.) There is a fancy word used to describe this event. We call it “transubstantiation.” You can call it a wonderful opportunity to spend your own quiet prayerful time with our Savior once you’ve received Him in communion! Belief in Christ’s Real Presence in the Eucharist goes back to the first century AD. For example, St. Paul wrote to the Corinthians "The cup of blessing which we bless, is it not a participation in the blood of Christ? 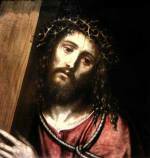 The bread which we break, is it not a participation in the body of Christ?" (1 Cor. 10:16). Keep in mind, going back to the first of our Acts of Faith before Communion, that we must receive our Lord worthily, that is to say, in a state of grace, free from mortal sin. If we have venial sins on our souls, we can still take communion. In fact Communion can be a powerful antidote to the temptations to sin. When we take Communion in a state of mortal sin we are only compounding our estrangement from God. As St. Paul wrote “Whoever, therefore, eats the bread or drinks the cup of the Lord unworthily will be guilty of profaning the body and blood of the Lord" (1 Cor. 11:27). The Catechism of the Catholic Church calls this sacrilege “a grave sin...for in this sacrament [of the Eucharist] the true Body of Christ is made substantially present for us” (CCC 2120), thus reinforcing St. Paul’s words as well as our belief in the Real Presence! Keep in mind, however, that as long as we are truly sorry for our sins in Confession and make the effort to avoid them afterwards, God wishes to show us His mercy! And from both the sacrament of Penance as well as the Eucharist, He’s ready to give us the graces we need for holiness.